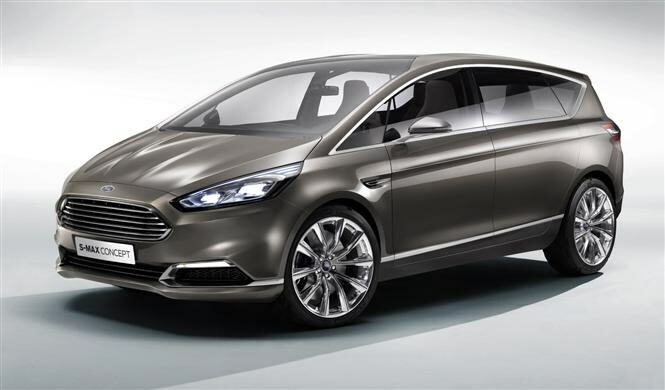 Here is the new Ford S-Max concept, a close-to-production preview of what will be unveiled at the Frankfurt Motor Show in a couple of weeks’ time. Expected to go on sale in 2015, the current S-Max has been a huge success for Ford since its launch eight years ago, bringing new customers to the brand. Ford has concentrated on making the new S-Max sportier-looking, after extensive customer research showed that style has become an important factor for car buyers in this segment. The front-end represents the new Ford design language as seen on the latest Fiesta, with the Aston Martin-style grille, distinctive headlights and sweeping bonnet. Some well-positioned chrome detailing, a feature line which runs along the side of the car and a lower roofline create a sleeker and sportier profile than the model it replaces. A few of the styling cues from this concept like the thinner wing mirrors and extra-long windscreen and glass roof are yet to be confirmed for production. The new S-Max concept features the latest upgraded version of Ford’s Sync infotainment system as well as debuting additional features including technology that will be able to monitor a driver’s heart rate and glucose levels and voice-control smart phone app connectivity. One of the highlights is a new Dual-View Display in the centre console, which will allow the driver and front passenger to view different things simultaneously - ideal if you have a child in the front who can watch a movie while you have the sat-nav in operation. Safety has also played a key role, and the S-Max concept features the latest generation pre-collision assist and protection system, Park Assist and a cross traffic alert system which warns you if cars are going to hit you when pulling out of a junction or parking space. Available as either a four, five or seven-seater, the new S-Max concept aims to offer more practicality than ever before. The middle seat in the second row folds forwards to allow step-over access to the optional third row while also transforming into a storage option with cup holders for the rear passengers. Ford has confirmed that when the S-Max reaches showrooms it will be available with a new 1.5-litre EcoBoost turbocharged petrol engine which will deliver greater fuel economy and lower emissions. Diesel engines will also be available; a 1.6-litre and 2.0-litre options are expected. As ever, Parkers will be among the first in the world to drive this new car. Keep an eye out for the full Ford S-Max review coming soon.